Though bumping is (obviously) a primary vehicle through which the Code is enforced, it's not the only one. Everything is fair game, so long as it can help guide a miner toward the path of reform and prosperity. Some New Order loyalist corporations, such as Arctic Dungeon, have used wardecs to achieve peace and get miners to join the New Order. 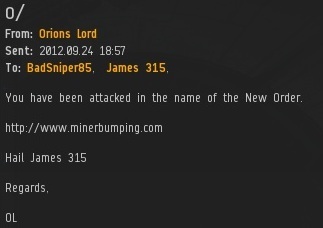 Infiltrating miner corps and attacking the miners during their mining ops is also a useful tool. Several days ago I wrote about Agent Riku Klayton's use of this method to instruct an orca and a few miners. Afterward, Riku sent me a link to a video in which he recorded the attack. It's clear he took joy in giving those miners encouragement. Another Agent, Orions Lord, prefers the can-flipping method. 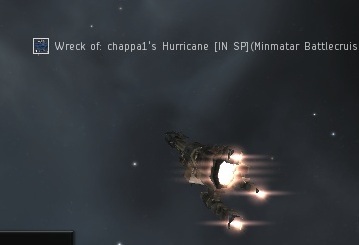 After using a procurer to kill a hulk in this manner, he sent the miner an EVEmail explaining the situation. 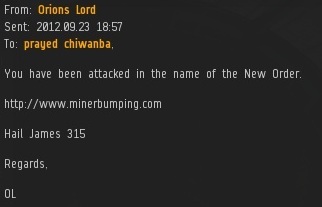 This was helpful, because it let the miner know the attack was not some random act of violence. It had purpose. It remains to be seen whether the miner fully understood. Orions Lord continues to let each of his victims know that their ships were forfeited due to their violations of the Code. ...And then there's good, old-fashioned suicide ganking. Agents Shogun Chaos and Yamamaya Hayahikigane attempted to reason with the miner, but they can be stubborn. Yamamaya Hayahikigane > everyone needs a mining permit, mmkay? Shogun Chaos > so u didnt want that ship anyways? Our work will continue as long as it is required. It's also worth pointing out the diversity of tactics used by these Agents, and where they took place. Arctic Dungeon's wardecs usually occur in Lonetrek, Riku's corp infiltration was in Devoid, Orions was active in The Citadel, and Shogun launched his attack in Domain. Four different regions represented in one blog post. Whew! As for the Agents themselves, they have proven Invincible. Just the other day I was training a new Agent, who was flying a bumping caracal in Elonaya. The Scorp was shooting cruise missiles at my Rifter which was about 500 feet from him in afterburner warp. The damage was minimal but I wasn't doing anything to him. So I moved out of his scrambler and warped off declaring my miraculous survival (due to the power of the New Order and The Code). Gexcolo > Is bing one of those "Order" assholes? Bing Bangboom > now you all see the power of The Code. You may send me the 10,000,000 ISK and begin your life in the New Order! Bing Bangboom > Look here now. 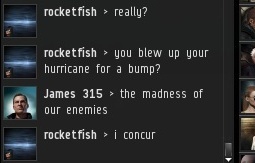 I was in a frigate and that was a Scorpion Navy Issue and he couldn't kill me. Bing Bangboom > How can you explain that without the power of The Code? Bing Bangboom > All hail the Power of the New Order! Blessed are those who have seen and BELIEVE! 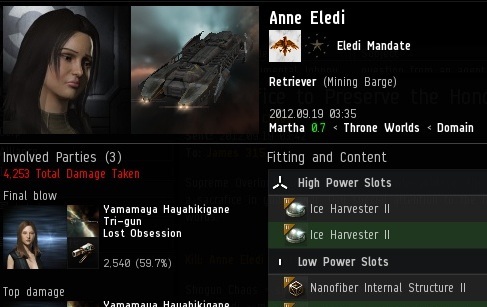 The New Order of Highsec, winning hearts and minds every day. Quite a few charisma recommended to their identity. Having said that, if rolex replica uk reaches awesome different watches to get gentlemen, discovered take a look at many of the rolex replica uk this gentlemen out of diverse global financial background scenes should purchase. Supplied here are a few the top part 5 look at building providers, quite a few helpful watch-facts plus a long list of 'affordable to get all' fake tag heuer very. Try it out! The following Swiss deluxe watch vendor, contains a track record with developing couple of, 000 different watches every day. Tag heuer is likewise because of by using all five revolutions around replica watches uk which will boost the cost however it has the different watches. At this moment, each one rolex replica sale maded by tag heuer is definitely a form of craft, nonetheless to be able to generate a renown group.